The United States is at a tipping point when it comes to policies that help smokers quit, according to the American Lung Association's "Helping Smokers Quit: Tobacco Cessation Coverage 2012" report. Released today, the annual report provides a comprehensive review of each state's tobacco cessation coverage and an up-to-date look at federal coverage and requirements under the Affordable Care Act. "Over the next year key decisions will be made by the federal government and the states about whether or not they will help save lives, prevent disease and reduce health costs," said Paul G. Billings, Senior Vice President, Advocacy and Education at the American Lung Association. "We know that the vast majority of smokers want to quit, but the complex web of state and federal coverage for effective quit smoking programs and treatments prevents too many from getting the help they need. States and the federal government can reduce the enormous health burden of tobacco use by providing access to these proven interventions." The American Lung Association report shows that the federal government has missed several key opportunities to improve access to quit smoking medications and counseling. The record for the states is mixed, but far too many fail to ensure coverage. Connecticut and Tennessee announced new benefits for everyone in 2012 that are close to comprehensive. 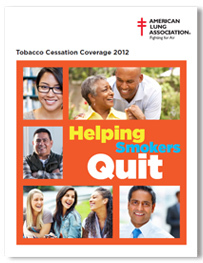 Florida, Georgia, Nebraska and New Jersey added new cessation benefits for state employees in 2012. Telephone quitlines are also an essential part of any state's tobacco cessation efforts. As more and more smokers want to quit, the majority of states are not providing adequate funding for their quitlines. Only two states—Maine and South Dakota—currently invest in quitlines at or above the recommended amount. This is a critical lost opportunity for people who are trying to quit. On November 26, the U.S. Department of Health and Human Services (HHS) published a proposed rule that requires the Essential Health Benefit coverage mandated by the Affordable Care Act to cover preventive services, including tobacco cessation. However, because HHS has not yet defined what insurers must include as part of a tobacco cessation benefit, the Administration missed a crucial opportunity. Now, each state can choose its own benchmark plan, which will then serve as the Essential Health Benefit standard for plans in that state's health insurance exchange. Until HHS officially defines a comprehensive tobacco cessation benefit, it has missed a crucial opportunity to provide many smokers with new access to help quitting, and to establish tobacco cessation as a truly essential health benefit for all health insurance coverage. HHS's failure to act provides an opportunity for states, according to the report. State policymakers can now help their smokers quit by including comprehensive tobacco cessation benefits as they implement state health insurance exchanges and Medicaid expansions. "Too many states are not providing the needed coverage and others are cutting it," added Billings. "Maine's governor cut Medicaid coverage of tobacco cessation medications as part of a short-sighted cost cutting strategy." Tobacco use is the leading preventable cause of death in the United States. The economic costs in the U.S. due to tobacco total $193 billion annually. Providing comprehensive quit-smoking treatments is crucial in both saving lives and curbing health costs – one recent study showed that providing this help has a 3-to-1 return on investment. "Giving all smokers access to a comprehensive cessation benefit is not only the right thing to do, it's the smart thing to do," said Billings. "The bottom line is that quitting smoking saves lives and saves money."